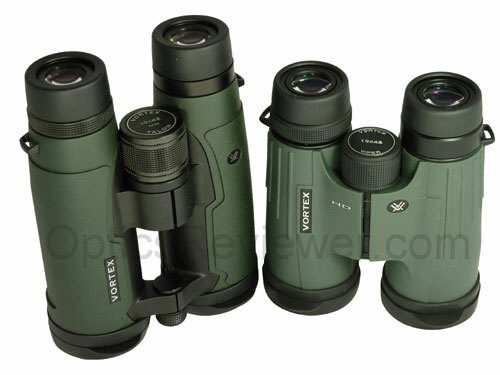 Talon HD vs Viper HD vs Razor HD binoculars. Talon HD vs Viper HD vs Razor HD. How do they compare against each other? 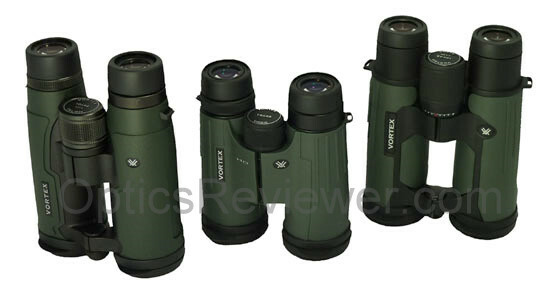 Which binocular wins in the Vortex Talon HD vs Viper HD comparison and why? If the Vortex Razor HD is included, how does that affect things? We originally bought all three of these binoculars and wrote up individual reviews of them. We soon noticed that, rather than reading each of the individual reviews, many were looking for an article that took the information from the reviews and made a direct Talon HD vs Viper HD comparison and a significant number were interested in including the Razor. When we started to receive e-mail asking for a comparison article, we saw the light and here is the comparison. As a distillation, this article touches on only the high points. You'll want to read an individual review for full information and our opinions about a model's various aspects or features. One of the reasons for a Talon HD vs Viper HD comparison is that the Vortex Viper is about $150 more than the Talon. In this respect, they almost share the same price point. For those of us who are stretching the budget to get a Talon, the $150 is a lot to consider. For those who are budget minded, but may be considering the Viper or Razor, they're interested in what they'll get for the price increment. Others are simply interested in finding the best optics for the money. Comparisons provide for each of these interests. Let's have at it then, shall we?!? "Since I use Gmail, I could not post a comment [on the page] about how truly helpful your discussion about the relative merits of the three Vortex binos was to me. Great site and solid advice is much appreciated." "…Use what you want of my comments. My pleasure to assist you folks because you certainly were of assistance to me in my binocular selection. There is a tremendous NEED for honest and highly knowledgeable and unbiased testing in the world of optics. Camera info is readily available, but there is very little truly reliable analysis of binoculars, spotting scopes, range finders and rifle scopes. Billions of dollars are wasted in trial and error evaluations by sportsmen like me annually." The binoculars we compare in this Talon HD vs Viper HD vs Razor HD comparison are each in the 10X42 configuration so that direct comparison is as easy as possible. In the Talon HD vs Viper HD chassis comparison, we find the Talon HD built on an aluminum frame while the Viper is polycarbonate-based. If to compare the Viper HD vs Razor HD, the Razor's frame is made of magnesium. Each has its own merits and we like each of them for reasons specific to the material. Aluminum is light and is an excellent choice to keep the unit affordable while providing durability under normal use. Polycarbonate is quite light and may stand up to slightly rougher use with grace. Many of the tough and durable plastics today are polycarbonate compounds. It takes quite a bit to break it, but if it does break, it can be quite difficult to mend! Magnesium has been used extensively in competition automobiles, for example, where there is a mandate to keep weight to a minimun while maintaining strength because it's even lighter than aluminum. Which is best for you? It depends a great deal on you and how you'll use your binocular. The diopter adjustment part of the Talon HD vs Viper HD comparison shows that the adjustment is provided by a ring on the right eyepiece on each of them. On the Talon HD, it moves stiffly enough to prevent much of the accidental "adjustment" that can occur during normal handling and use. The Viper HD's diopter adjustment is also via a ring on the right eyepiece, however the Viper's ring locks in place to further reduce unintended changes to the setting. The Razor HD's diopter adjustment is changed by pulling the center focus wheel back toward the ocular lenses and then locked by pressing it back - each direction's travel is confirmed with a "click." While we like diopter adjustments that lock so they can't be "adjusted" by mistake, the Talon's comes close. The Talon HD vs Viper HD weight comparison shows the Talon HD coming in at 26.5oz/751g and the Viper HD on the scales at 24.6oz/697g. The Razor HD weighs in at 29.5oz/836g, making the Viper the lightest and the Razor the heaviest of the three. Of course, if weight is an issue a person can change a binocular's configuration and significantly reduce weight by switching to smaller objective lenses for example. For size in this Talon HD vs Viper HD vs Razor HD comparison, from the objective lenses to ocular lenses, the Talon HD is tallest at 6.7 inches (17.0cm), the Viper HD is shortest at 5.8 inches (14.7cm), and the Razor HD occupies middle ground at 6.5 inches (16.5cm). None of the three is overly large, but the Viper HD takes up less space than either of the other two. Each of these roof prism models utilizes a center-focus arrangement. The Talon HD vs Viper HD comparison of the number of turns of the focus wheel to go from close focus to infinity for the Talon is 1.75 vs the Viper's slightly faster focusing and 1.5 turns of the focus wheel. The Razor HD's 1.5 turns of the focus wheel make it comparable to the Viper in this respect. (When you look at the individual reviews, you'll find out why we prefer a "faster focus" and how much we feel is acceptable.) While individual binoculars may vary, we found the Talon HD's focus to be buttery smooth, the Razor HD's focus wheel to have more resistance than we expected (although it lost a good bit of that with use), and the Viper HD's feel was closer to the Talon's. We found that each of these binoculars resolved details better than binoculars without dielectric prism coatings, HD or aspheric lenses, and those which were not fully multi-coated. We, as optics users, sometimes forget the effect that being fully multi-coated has on the viewed image and the benefits conveyed by optics which are fully multi-coated should not be ignored. Each binocular has an optical sweet spot, usually in the middle of the focused view, where you can see the most detail, the colors are clearest, and the contrast is best before the image becomes increasingly blurred as you approach the periphery of the field of view. The better the optics, the narrower (or smaller) the blurred image around the periphery of the view will be. Which optics came out on top in this Talon HD vs Viper HD vs Razor HD comparison? In the individual reviews, you'll find more information about our findings and what we believe accounts for the differences in the width of the blurred peripheral image. For this comparison, we'll simply note that we found about 80% of the Talon HD's image radius was quite clear before it started to fuzz or blur. The Viper HD we tested showed about 87% of the image's radius clearly before blurring became noticeable. Finally, the Razor HD's view presented a sharp, clear image for about 95% of the radius and even then the blurring was not as significant as with the Talon and Viper models. Was the larger usable area of the Viper HD enough to compensate for the larger field of view of the Talon HD? We thought it was enough to significantly reduce the Talon's advantage in that regard. For resolution of details, we found that the Talon HD vs Viper HD comparison had them resolving approximately the same level of detail. The Razor HD compared resolved a greater level of detail than either the Talon HD or the Viper HD. This is a measure of how much detail you can see in a viewed image and generally our human nature is to want as much detail as we can afford! Chromatic aberration was not a problem in the Talon HD vs Viper HD vs Razor HD comparison. We couldn't induce it in any of the three binoculars we tested. This is a significant area in the Talon HD vs Viper HD vs Razor HD comparison. It was our observation that the baffling to control stray light in the binoculars' barrels was least effective in the Talon HD. The Viper HD's control of stray light in its barrels was significantly more effective and the Razor HD's baffling produced the best light control of the three binoculars in our tests. If you'll be using your binocular where light is strong (typically around snow/water, sometimes in the desert and on the plains where there is less to shield from the sun, and possibly during autumn when there is less foliage in wooded areas, for example), you'll likely want to consider the Viper HD and Razor HD more favorably. Certainly, the Talon HD can and will serve the needs of many and provide as much as an individual may desire. The Talon HD vs Viper HD comparison shows that they will provide about the same amount of detail and a clean, clear, crisp view under ordinary circumstances. It handles quite nicely and will provide a great deal of enjoyment. Is it a good buy? Yes - we believe it is. Use these link to go directly to the Talon HD at Amazon.com . With a relatively modest price increment for the Viper HD, the light control to reduce glare is significantly better and the usable field of view reduces the advantage of the Talon HD's somewhat wider field of view. This improved functionality in optically adverse conditions will be important to those who use their optics near water or snow, in the desert, plains or mountains, or for otherwise viewing in images in strong light. The Viper HD seemed durable and easy to use. We feel that this binocular is a very solid performer for the money. The Viper HD is available at Amazon.com . What about the Razor HD? As one would reasonably expect with the price differential, we feel it's unquestionably the best of these three binoculars as far as its build/construction, baffling for stray light (glare, etc) control, and optics are concerned. It is a good binocular in its own right at its price point, however. There are many who will weigh its performance against its price and find that it is priced significantly lower than well-known brands from Europe and elsewhere which cost significantly more. Particularly if you're considering a binocular that will be used as a working tool, you'll want to see if your budget can accommodate the Razor HD. It is available at Amazon.com . Here is a link that will provide information about availability and pricing for each of these three binoculars for our friends who shop with Amazon.co.uk . After seeing the very succinct and abbreviated comparison above, we recommend reading the fuller, individual reviews of the Talon HD, Viper HD, and Razor HD binoculars. Your intended use of the binocular will almost certainly affect your decision as to which might best serve your needs.